This entry was posted in Audio, thiruvAimozhi, thiruvAimozhi 4th centum on April 24, 2017 by Sarathy Thothathri. In first pAsuram, AzhwAr, in line with mahOpanishath statement “EkOhavai nArAyaNa AsIth” (Only nArAyaNa existed before creation), says “when the kAryarUpaprapancham (the universe in the form of effect) was completely non-existing, sarvESvaran who is the cause of the universe, created the universe through chathurmukha (four-headed) brahmA; such emperumAn is mercifully standing to be seen and surrendered by you all in [AzhwAr]thirunagari which has mountain like tall mansions; instead of taking shelter of him, you are searching for other dependable dhEvathAs”, and condemns them. Subsequently, AzhwAr in line with statements which establish emperumAn’s causal nature, asks [the materialistic people] “while sarvESvaran who is the cause for everything is present, which other dhEvathA are you searching for?”. See nanjIyar‘s introduction. It is also highlighted that emperumAn is present in thirunagari with motherly affection towards the suffering souls to help them. nAdudhirE – you are approaching (as shelter). When dhEva species, their world, other species, all entities (in collective form or in no name/form) were all annihilated and became subdued [in bhagavAn], emperumAn created brahmA who is the samashti purusha, dhEvathAs, their world and other different species; when such emperumAn is standing well in [AzhwAr]thirunagari that is having tall mountain like mansions, he being the cause of everything and the great benefactor, you are approaching these dhEvathAs who are [also] affected by creation and annihilation. piLLAn gives an elaborate list of pramANams from SAsthram citing emperumAn‘s supremacy. Please refer to the original commentary for the same. onRum dhEvum … – dhEvathAs and their worlds, AthmAs who have assumed forms such as manushya (human) etc, mahath etc which are causes for oval shaped universes, and all others – at the time when they were not present – “onRum” (none of these) is recited at the end of this section. Alternative explanation – since effect becomes subdued in cause [during deluge], as bhagavAn is the cause, dhEvas, worlds, and all other entities are subdued in him and are thus not visibly present. It is said in chAndhOgya upanishath “sadhEva” (only sath remained). nAnmugan … – When others set out to protect/help the rest, they will see some reason and think “there will be some use by them some day” and then only help; sarvESvaran is the only one who protects without expecting anything from anyone. nAnmugan thannodu dhEvar ulagOdu uyir padaiththAn – Through chathurmukha (four-headed) brahmA, emperumAn created their worlds and the different forms accepted by chEthanas (sentient beings). sarvESvara created chathurmukha (four headed brahmA); chathurmukha created panchamukha (five headed rudhra); panchamukha created shaNmukha (six headed skandha) – this way creation became variegated. Though worldly people give great importance to rudhra and become confused, since AzhwAr did not see anything special in rudhra, instead cites brahmA who was born directly from the divine naval lotus of bhagavAn and includes rudhra in the group of [remaining] dhEvathAs. 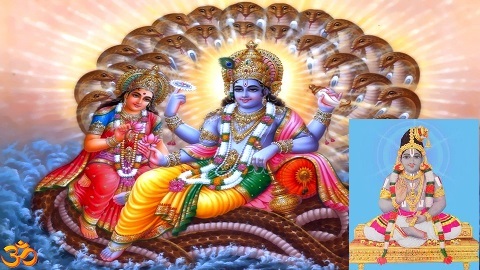 In samhAram (annihilation), AzhwAr cited mahath thathvam etc; in srushti (creation), he cited brahmA; the reason for this is – no one considers mahath to be supreme; but common people consider brahmA as supreme – so, to eliminate such doubts, AzhwAr cites brahmA and discards him saying he is also part of the created entourage. emperumAn created without any difference, brahmA who creates the 14 layered oval shaped universe, the ten prajApathis (progenitors) who are created by brahmA to manage routine/subsequent creation, the worlds which are the abodes for their enjoyment, the citizens of such worlds etc; he also bestowed them body and senses, to let them seek enjoyment and liberation. kunRam … – Such emperumAn, after creating these, instead of being away from those created places, stood in AzhwArthirunagari which has tall mansions which appear like mountains that are filled with precious stones. As said in SrI rAmAyaNam ayOdhyA kANdam 50.3 “ASayAyadhivArAma: punaSSabdhApayEthithi” (sumanthra said – I waited along with guha there with the desire of SrI rAma calling for me again), emperumAn is waiting there thinking “with the body and senses I have given them, would they come to me instead of saying ‘na namEyam‘ (I will not worship him)”. Alternative explanation – emperumAn waiting there thinking “even if I myself tried to accept them, would they at least not reject me?”. There [in SrI rAmAyaNam], the SEshabhUtha (servitor) waited to be accepted by SEshi (the lord); here the lord is waiting to be accepted by the servitors. Adhip pirAn niRka – Giving up such emperumAn who has arrived with affection towards you all and reside permanently in thirunagari. maRRaith theyvam nAdudhirE – You can only search for other dhEvathAs but cannot find the proper refuge. As said in “vAsudhEvam parithyajya yOnyam dhEvamupAsathE | thrushithO jAhnavIthIrE kUpamganathidhurmathi: ||” (one who leaves aside krishNa, who is the son of vasudhEva, and worships other dhEvathAs, that fool is like a thirsty person who is digging a well at the banks of river gangA), [one who is seeking other dhEvathAs is like ] a thirsty person, while river gangA is flowing nicely, instead of drinking water directly from that and quenching his thirst, is digging a well to quench his thirst; AzhwAr is condemning those who are giving up emperumAn who is natural/apt lord, easily approachable, easily worshippable and with great qualities, and are seeking out other dhEvathAs who are inapt, difficult to attain, difficult to worship and with no great qualities, and even if worshipped, it is as said in thirumAlai 10 “sEttai than madi agaththu selvam pARththu” (trying to get wealth from the inauspicious mUdhEvi deity), those dhEvathAs who are lacking SrI mahAlakshmi in them. This entry was posted in thiruvAimozhi, thiruvAimozhi 4th centum on April 23, 2017 by Sarathy Thothathri. AzhwAr, after thinking “it is better to die than being amidst avaishNavas”, asks emperumAn “you mercifully finish me”, and as he did not oblige, AzhwAr thought “since I have no means to give up my association with them, let me convert them as vaishNavas and live with them” and instructed to them about the supreme lordship and easily approachable nature of emperumAn and instructs them “You take shelter of such emperumAn”. In the perspective of AzhwAr who is seeing and being together with emperumAn and being blissful due to such union, and being compassionate towards the AthmAs (souls) who are missing out on emperumAn, he mercifully instructs them “you take shelter of emperumAn”. Meditating upon these aspects, AzhwAr concludes by explaining how emperumAn‘s pleasure is the only goal for this AthmA, due to emperumAn being the ultimate goal, and his ultimate enjoyable nature. As in a land, when one side is barren and other side is fertile, while the nithyavibhUthi (paramapadham – spiritual realm) and nithsasUris (eternally free souls in paramapadham) are fully engaged in bhagavath anubhavam (enjoying bhagavAn), the residents of this desert like samsAram (material realm) are attached to sensual pleasures and having such gains and losses as joy and sorrow and being distressed turning away from bhagavAn – meditating upon this, AzhwAr decides to reform them and is thinking “why should we worry when sarvESvaran exists?”, prays at the divine feet of emperumAn “While your highness is present, can you let these AthmAs suffer? you should reform them too and bring them into the ideal path” and emperumAn replies “this is not my fault; they are not achith (insentient entities) where I can use them as I desire, and they are chEthanas (sentient entities) and should have the attachment towards me to attain irrevocable liberation; I too like you, tried my best and returned with teary eyes, being unable to uplift them”. AzhwAr then asks “Though they don’t have the attachment, and since desire is the only expectation to attain the [ultimate] benefit, why can’t you yourself create such desire in them?” and forces emperumAn like udhanga did. After the mahAbhAratha battle ended, when krishNa arrived after helping pANdavas defeat dhuryOdhana and his army, udhanga, being partial towards dhuryOdhana and his brothers, asked krishNa “While you are commonly related to both pANdavas and kauravas, you were partial towards pANdavas and destroyed dhuryOdhana et al”, krishNa replied “I tried to mediate as best as possible, but dhuryOdhana et al said ‘we will not live if pANdavas lived happily’ and only then I destroyed them”. udhanga further asked “as you are the controller of all, why did you not create the desire in them to live peacefully?”. emperumAn replied to AzhwAr “As they are chEthanas, I have to bestow the benefit only based on their desire; let that be; there is no loss for you; you see the divine abode where I am going to carry you and place you” and showed him paramapadham and AzhwAr became grateful seeing that – this is what happened in previous decad; further, in this decad, due to his great compassion, he tries to reform the samsAram which was even given up by sarvESvara. AzhwAr desired to uproot the samsAram [materialistic existence]; the root for samsAram is two fold – attachment towards other dhEvathAs and lack of knowledge in supremacy of bhagavAn; for that, AzhwAr is instructing about supremacy of bhagavAn. [Is there any use of such instructions?] embAr, having learned all vEdha SAsthrams, still unable to determine “who is supreme”, thought “is there any knife that cannot cut a root vegetable, is there anyone who is not worshippable by me?” and bowed in front of any one he saw; and [the Acharyas] will mercifully explain “among emperumAnAr‘s followers, even those ladies who have not taken up formal education, will consider dhEvathAntharams (other dhEvathAs) as a stone which is part of building stove in the kitchen, due to knowing the principle explained in this decad” [As SAsthrams explain the glories of SrIman nArAyaNan as well as other dhEvathAs, they could lead to confusion even for great scholars. But as thiruvAimozhi simply explains the glories of SrIman nArAyaNa, the principle is very clear for everyone to understand]. embAr [subsequently] said “thruNikrutha virnchAdhi” [In comparison to taking shelter of SrI rAmAnuja‘s divine feet, even [the post of] brahmA et al are considered as grass only”. [nampiLLai explaining the attitude of materialistic people who refuse to accept bhagavAn’s supremacy] kArthavIryArjuna, a great king, while ruling over his kingdom, if anyone thinks about engaging in sinful activities, he would right away appear in front of them with his bow and arrow and avert such sinful acts – scholars of vEdham would agree to this fact; while chEthanas (sentient beings) accept whatever is done by a lowly human king, they will question if it is attributed to sarvEsvara who is omnipotent, omnipresent, will pervade everywhere and protect everyone. These people will agree if it is said “jAthi vyakthithORum parisamApya varthikkum” (the category/species of an entity pervades all through the entity) and will say “yes, it is reasonable for an achith entity (jAthi which is an insentient aspect) to pervade all through the body” but when it is said “the supreme lord will pervade everywhere”, they will doubt that principle and refuse to agree. In the first thiruvAimozhi (decad) 1.1, for his own experience, AzhwAr meditated upon emperumAn‘s supremacy which was revealed by emperumAn himself and explained it as mentioned in Sruthi (vEdham) as in thiruvAimozhi 1.1.7 “uLan sudar migu suruthiyuL” (bhagavAn is present in the radiant vEdham); realising that his own experience could be useful to others, he thought “since they are chEthanas, this is enough for them [to be reformed]” and explained emperumAn’s supremacy as done in ithihAsams and purANams in thiNNan vIdu, 2.2 decad; but since they did not get reformed even by that, AzhwAr thought “let me instruct emperumAn’s supremacy to them [again]”, and as part of that, in this decad, AzhwAr eliminates any doubt on any other dhEvathA having supremacy and establishes bhagavAn’s supremacy. In the first thiruvAimozhi (decad) 1.1, AzhwAr mercifully explained bhagavAn‘s supremacy in paramapadham; but that was beyond the reach of samsAris [worldly people of this material realm]; so, he then mercifully explained bhagavAn’s supremacy in his incarnations in 2,2 “thiNNan vIdu” decad; even that was beyond the reach of those who are living subsequent to those ancient times; those two were difficult to reach due to gap in dhESa (place) and kAla (time); to eliminate those shortcomings. as said in thirunedunthANdagam 10 “pinnAnAr vaNangum sOdhi” (the radiant form which is worshipped by future [all] times), here AzhwAr is mercifully explaining emperumAn‘s supremacy in archAvathAram which is easy to behold for people of all times. Now, what is the method pursued by AzhwAr to reform them? While everyone desires to have joy and be free from sorrow, but as one does not acquire the desired joy and gets the undesired sorrow, it is to be admitted that “there is a controller who makes people go through these joy and sorrow at specific times”. Why is that needed? Why can’t we just say that puNya (virtues) and pApa (vices) are the causes for joy and sorrow respectively, and they themselves could control these? When we look at the nature of those puNya and pApa karmas, they are achEthana (insentient) and as they are different types of activities, they will be finished when the action is completed; when it comes to wood carving, without the carpenter, as the machines and tools are of no use, even for these puNya and pApa, without the presence of a sentient being, they themselves cannot give the fruit of the actions; now, more than imagining a principle called “apUrvam” and saying “this invisible component will bestow the result based on one’s action”, it would be better to say “after a paramachEthana (supreme sentient being) contemplates about the actions, the results are bestowed based on his condemnation or mercy”. Now, who is that paramachEthana (supreme lord)? What are his nature and characteristics? What are his activities? These should be known through pramANams (authentic sources of knowledge). Among the pramANams, since prathyaksham (perception) is limited to our senses and cannot reach beyond our senses, it cannot be considered as a pramANam (fool proof source of knowledge); can we consider Agama texts as pramANams? No, since they have the faults based on being error prone (such as deception etc) due to being conceived by individuals’ intellects; so, vEdham which is considered as primary among 14 types of sources of knowledge, and which is nithya (eternal), apaurushEya (not created by any individual), being free from errors such as deception, explained by sAthvika purANams (purANams that are in the mode of goodness), must be the pramANam (authentic source of knowledge). Why is their special mention of “sAthvika purANams” instead of just “purANams”? The compilers of purANams learned a few things from brahmA and then compiled their respective purANams; as said in svEthAsvathara upanishath “yO brahmANam vidhadhAthi pUrvam yOvaivEdhAmScha prahiNOthi thasmai“ (first, bhagavAn created brahmA and then bhagavAn instructed him the vEdham), though that brahmA was created by sarvESvara himself, while he was explaining the rishis (sages) as in SrIvishNu purANam 1.2.10 “prushta:prOvAcha bhagavAnabhjayOni: pithAma:” (brahmA who was born in the divine navel of SrIman nArAyaNa and who taught the great sages), he instructed them “I am bound by the three types of qualities [sathva (goodness), rajas (passion) and thamas (ignorance)]; you leave aside what I said when my passion and ignorance were more, and pursue what I said while my goodness was more”; this is explained in mAthsya purANam “agnESSivasya mAhAthmyam thAmasEshu prakIrthayathE | rAjasEShucha mAhAthmyam adhikam brahmaNOvidhu: | sAthvikEshvadhakalpEshu mAhAthmyam adhikam harE:” (When I am in mode of ignorance, I speak the glories of agni (fire god) and Siva; when I am in the mode of passion, I speak the glories of myself; when I am in the mode of goodness, I speak the glories of SrI hari (vishNu)”; thus, through the guNa bhEdham (difference of qualities), one can understand the different individuals who are glorified and through these, the gradations in the purANams can be understood; thus, vEdham which is explained through sAthvika purANams is considered as the authentic source of knowledge. Though vEdham does not have the fault caused by the three qualities [sathvam, rajas, thamas], as it set out to explain bhagavAn who is with spiritual/material realms, as said in SrI bhagavath gIthA 2.45 “thraiguNya vishayA vEdhA:” (are focussed on the well-being of the ones having the three qualities (sathva, rajas, thamas)), since vEdhams are focussed on the chEthanas (sentient beings) who have the three qualities, vEdhams will give advise based on the qualities of each type of individual. Though vEdhams are advising in this manner, one is not forced to accept everything as a thirsty person will drink as much water as required to quench his thirst, even though the river may be flooded as said in SrI bhagavath gIthA 2.46 “yAvAn artha udhapAnE sarvatha: sampluthOdhakE | thAvAn sarvEshu vEdhEshu brAhmaNasya vijAnatha: ||” (For the one who desires to use some water, only that much is accepted from a reservoir which is filled with water in all sides. Similarly, For a wise mumukshu (one who is desirous of mOksham), though being a vaidhika [follower of vEdhas], in all of vEdhams, only that which is required (as means for mOksham) is pursued [Implies that all aspects of vEdhas need not be pursued by mumukshus]); so, a mumukshu (one who desires liberation) shall only absorb what is required for him/her. This vEdham is considered to be two parts, namely pUrva bhAgam (former part) and uththara bhAgam (latter part); in this, pUrva bhAgam elaborately explains the method of worship, and explains the goals such as svarga (heaven in this material realm) and the means to attain them; uththara bhAgam explains in great detail about sarvESvaran’s svarUpa (nature), rUpa (form), guNa (qualities) etc. Now, what is the object/target of worship/meditation? The kAraNa vAkhyams (the aphorisms which identify the cause) establish that one should worship the cause of the world and other creations in the world. How so? Explaining in thaiththirya upanishath bruguvalli “yathO vA imAni bhUthAni jAyanthE … thadhvijigyAsasva thadhbrahma” (From which, the universe is created, on which, the universe is sustained, in which the universe dissolves, that is to be known and that is brahma), eliminating the scope of worship for other entities, established the worshippable nature of jagath kAraNa vasthu (that which is the cause of the world); it is said in chAndhOgya upanishath “kAraNam thu dhyEya:” (the object of meditation is that which is the cause of everything). That dhyEya vasthu (object of meditation) is explained by the word “sath” as in chAndhOgya upanishath “sadhEva sOmya idham agra AsIth” (Oh SvEthakEthu who is qualified to drink sOma juice! before creation, sath only existed) [first, eternity/permanence is established]; in another SAkhA (branch of vEdham), it is explained by the word “AthmA” in aitharEya upanishath “AthmAvA idhamEva agra AsIth” (before creation, the world existed as the soul) [then, its sentient nature is explained]; since that could be confusing, it is referred to by the word “brahma” in vAjasnEya “brahmavA idham agra AsIth” (before creation, the world existed as the brahma, the great) [then, its huge/great nature is explained]; since brahma could have many meanings, it is explained by the word “nArAyaNa” in mahOpanishath “EkOhavai nArAyaNa AsIth” (only nArAyaNa existed before creation); but, vEdham also explains rudhra et al being the cause and worshippable as in svEthAsvathara upanishath “nasannasAchasachchiva Eva kEvala:” (neither sath (sentient entities) existed; nor asath (insentient entities) existed; only Siva existed) and in svEthAsvathara upanishath “Sambu: AkASa madhyE dhyEya:“(meditate upon Sambu who is amidst the ether); what is the purpose of those? Though they are indicated in this manner, by having purity and the ability to bestow joy, those names will only indicate nArAyaNa who is the viSEshya (substratum) [for those entities who are viSEshaNa (forms, attributes)]. Alright, if names like Sambu, Siva can be attributed to nArAyaNa, why can’t nArAyaNa name/form be attributed to one who is called Sambu, Siva etc? While Sambu, Siva names can be attributed to nArAyaNa by guNa yOgam [nArAyaNa having those specific qualities indicated in those names, i.e., Siva means pure, and nArAyaNa is obviously the source of all purity and so the name Siva can be attributed to nArAyaNa], name nArAyaNa cannot be indicated to any one else due to indicating nArAyaNa only by yOga rUdi (etymology/root and common prevalence). How is that certain names which commonly indicate certain personalities, are attributed to some other personalities? Words like indhra, prANa, AkASa do not just stop explaining the gross object and will go up to the underlying personality. Now, name indhra does not stop with indhra and will lead up to sarvESvara [who is the in-dwelling super soul of indhra and all]; similarly the word prANa does not stop with the five types vital air in the body but leads up to the one who sustains that prANa; similarly, the word AkASa does not stop with the great element space, but leads up to sarvESvara who sustains that space; similarly, the names Sambu, Siva et al will not stop short of indicating sarvESvara. In the same manner, as the words indicating prakAra (mode) will lead up to the prakAri (substratum), it will not stop short of indicating the prakAri [bhagavAn who is the prakAri of all]. Now, how can we explain what is explained in “thathOyath uththaratharam” [Others explain this as, there is purusha [nArAyaNa], but there is Siva, who is purushOththama. But our AchAryas explain this as, emperumAn who is greater than all individuals]? [Others ask] Having previously said sarvESvara using the word “purusha” and uththaratharam indicates “purushOththama”. How can this be explained? But since it is said in “yasmAthparamnAparamasthikinchith” (there is no one who is equal or greater than the supreme lord), the one who speaks like this [saying Siva is greater than sarvESvara] is speaking out of ignorance. He is speaking without studying the SAsthram properly first. When it says in “thasmin yadhanthasth upAithavyam” (that which is inside that bhagavAn should be meditated upon), it is stating that “just like him, his qualities [which rest on him] are also to be meditated upon”. Now, bhagavAn who is the cause of the world and the object of meditation, should be present at all times. While explaining this in the context of samhAram (deluge), it explains “EkOhavai nArAyaNa AsIth” (Only nArAyaNa existed) and explains that others did not exist saying “nabrahmAnESAna:” (brahmA did not exist; rudhra did not exist). Now, to clear our doubt “do they have any greatness in comparison to others?”, it considers them equal to other entities as in “nEmEdhyAvApruthivI na nakshathrANi” (Sky did not exist, earth did not exist, stars did not exist). Even while explaining creation, it treats everyone equally as seen in thiruvAimozhi 7.5.4 “nanmaip punal paNNi nAnmuganaip paNNi” (emperumAn created the water and then created brahmA). In this manner, AzhwAr mercifully removes any doubt in our mind about any supremacy of other dhEvathAs and tells “sarvESvaran who is greater than all, the creator of all, who is the abode of all auspicious qualities, the protector of all, in-dwelling supersoul of all, who is indicated by the name ‘nArAyaNa’, has descended along with all his greatness in AzhwAr]thirunagari to be visible for everyone; all of you enjoy him and be grateful to him”. This entry was posted in thiruvAimozhi, thiruvAimozhi 4th centum on April 22, 2017 by Sarathy Thothathri. In the end, AzhwAr says “This decad will help those who practice (learn/recite) it to attain the divine feet of emperumAn; hence, you practice it, reach his divine feet and be uplifted”. onRumin – (being inseparable) try to serve them. nammAzhwAr, the leader of AzhwArthirunagari which is having unsurpassed enjoyability, having the intention to attain the divine feet of krishNa, mercifully spoke about him who is the sarvaSEshi, who is having the ability to be present as in-dwelling soul in every entity, to lord over every entity and who eliminates the hurdles of his devotees just as he killed kESi, the demoniac horse; mercifully spoke in this decad among the thousand thamizh pAsurams on his divine feet; such decad will help one attain those divine feet themselves; you, who are engaged in this decad, attain those divine feet and try to serve them (being inseparable). thiruvadiyai – one who is the lord of all. nAraNanai – Not just the having lordship, but even when one rejects such lordship, emperumAn has the vAthsalyam (motherly forbearance) which makes him not give up on anyone. kEsavanai – Instead of merely showing motherly affection from outside, he appeared as a human [cowherd boy] and eliminated the enemies of them [the cowherd clan]. param sudarai – His supremacy which was visible even while assuming a human form. thiruvadi sErvadhu karudhi – One who has the desire to reach his divine feet. From the beginning this is AzhwAr‘s desire, as seen in thiruvAimozhi 1.1.1 “thuyaraRu sudaradi thozhudhu ezhu” (bow at the divine feet which removes the sorrows and rise). sezhum kurugUrch chatakOpan – It is the birth in this town which caused this great love in AzhwAr [towards emperumAn] – similar to the nature of the land in SrI ayOdhyA will nurture rAma bhakthi. thiruvadi mEl uraiththa ... – Among the thousand pAsurams, this decad will help one reach his divine feet; you too, for this, please go and pursue his divine feet. As you approach his divine feet, like a rice pot [which is totally dependent on its owner], giving up all enjoyment for self, try to serve his divine feet eternally. You serve him to his divine heart’s content, by being inseparable like iLaiya perumAL (lakshmaNa) and serve him, as said in “sAyujyam prathipannAyE” (having attained an equal position, and having their hurdles eliminated, they remain eternal servitors) and as said in parama samhithA “yEna yEna dhAthA gachchathi thEna thEna saha gachchathi” (wherever the lord goes, the servitor follows). For those who serve in this manner, do they have to give up what was given up by AzhwAr and pursue what was pursued by AzhwAr? This decad, on being meditated and practiced upon, will nurture detachment in worldly pleasures and will also help one reach his divine feet. This entry was posted in thiruvAimozhi, thiruvAimozhi 4th centum on April 21, 2017 by Sarathy Thothathri. In tenth pAsuram, out of great love, AzhwAr clearly explains “what was given up and what was pursued”. Subsequently, emperumAn asks “How did I eliminate the other benefits for you and bestow you the ultimate benefit?”, AzhwAr replies “I am blessed to give up aiSvarya (worldly pleasures) and kaivalya (eternal self-enjoyment), determined you who are Sriya:pathi (lord of SrI mahAlakshmi) as the goal and attained you too”. After seeing in front of me [the three different goals namely] a) the joy of worldly pleasure enjoyed by analysing individually through the five senses of seeing, hearing, contacting, smelling and eating and feeling agitated by these b) the joy of self-enjoyment which is incomprehensible, which is difficult to be comprehended by these senses and enjoy and which is very insignificant when compared to joy of experiencing bhagavAn and c) the togetherness of you and the one who is having distinguished forearms with ornaments like bangles, the best among women, who is known as SrI due to being the collection of all wealth, and determined the best means, gave up worldly pleasure and self-enjoyment and attained your divine feet. kaNdu … – Eye which is a tool to see, ear which is a tool to hear, skin which is a tool to feel touch, nose which is a tool to smell and tongue which is a tool to taste. The senses facilitate one to spend his/her life by just seeing, hearing, feeling, smelling and touching [worldly pleasures]. aim karuvi kaNda inbam – The worldly pleasure which is enjoyed by senses which are limited in capability like a measuring cup. The gyAnam (knowledge, consciousness) which is an eternal quality of AthmA, is contracted due to being bound by karma [puNya, pApa], comes out through the mind, and absorbs the pleasure/pain through external sense organs. 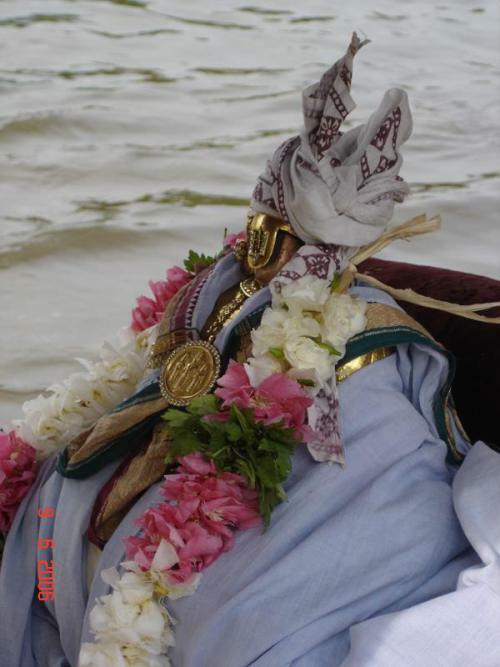 therivariya aLavillAch chiRRinbam – While compared to worldly pleasure, the AthmAnubhavam (kaivalyam, self-enjoyment) is difficult to attain, and when compared to bhagavath anubhavam (experiencing bhagavAn) it is worthless; since AthmAnubhavam is enjoyment based on the atomic AthmA, the enjoyment is also comprehensible. ozhindhEn – gave up these. siRRinbam – It is the opposite of “anthamil pErinbam” (endless great joy). oN thodiyAL … – When periya pirAttiyAr and you are together, the whole of nithya vibhUthi became subdued in your affection – I have seen this divine togetherness. thodi – bangle worn in forearm. The greatness for those bangles is, not to ever slip from her hands. Since she is nithyAnapayini (always inseparable [from emperumAn]), there is no reason for those bangles to slip once and be worn again. She is said in thiruchchandha viruththam 57 “sangu thangu munkai nangai” (The perfect lady who has beautiful bangles in her forearm). thirumagaLum nIyumE – You who are desired by such pirAtti as said in thiruvAimozhi 6.10.10 “iRaiyum agalagillEn“. nIyumE nilA niRpa – In both of your abhimAnam (affection/care), the whole thripAdh vibhUthi (3 parts – spiritual realm – paramapadham) will be present in a subdued manner. While it is said in SrIvishNu purANam 1.8.35 “nAnyOr vidhyathE param” (Except for SrIman nArAyaNan and SrI mahAlakshmI, there is no one else independently existing), everywhere people consider themselves to be the lords in this material realm. nilA niRpak kaNda sadhir – The proper situation of being under the shelter of you both, which is arranged by you; as said in Siva [linga] purANam “vaikuNtE thu parE lOkE SriyAsArdham jagath pathE” (In the divine world of vaikuNtam, vishNu is present with SrI mahAkshmi, being served by nithyasUris), the arrangement you have done. Have seen that. un thiruvadiyE adaindhEn – I approached those divine feet thinking “I should be present along with those nithyasUris and serve your divine feet”. This is what I am holding on to; whatever I have explained previously, have been given by me. By saying “ondodiyAL thirumagaLum nIyumE“, does it explain the togetherness in nithya vibhUthi (spiritual realm) [being served with many devotees]? As AzhwAr himself has said in thiruvAimozhi – 2.3.10 “adiyArgaL kuzhAngaLai udan kUduvadhu enRu kolO” (When will I be amidst the nithyasUris? ), and there are other pramANams such as in Siva [linga] purANam “vaikuNtE thu … bhakthai: bhAgavathais saha:” (be along with bhakthas and bhAgavathas). Also, as he said in “niRpanavum thirivanavum nIyE maRRoru poruLuminRi” (all immovable and movable objects are your manifestation only) and then said “kodu ulagam kAttEl” (don’t show me this cruel world) [where AzhwAr is saying there are innumerable entities in this material realm but all are pervaded and controlled by bhagavAn]; similarly when it is said “only pirAtti and perumAL”, it would imply the [spiritual] realm which is fully under the full care of that divine couple. But can emperumAn accept such servitude from AzhwAr in this material realm itself? No, it will be in paramapadham with emperumAn’s distinguished form, as lakshmaNa prayed to SrI rAma in SrI rAmAyaNam ayOdhyA kANdam 31.25 “bhavAms thu saha vaidhEhyA” (I want to serve you along with sIthAp pirAtti) and SrI rAma accepted lakshmaNa’s service as requested by him in SrI rAmAyaNam AraNya kANdam 15.7 “kriyathAmithi mAm vadha” (lakshmaNa to SrI rAma – order me in what should be done) [In case of SrI rAma, sIthA and lakshmaNa, they were all present together and so lakshmaNa could serve there as he desired. Here, AzhwAr specifically prays to be freed from this world and engage in kainkaryam in paramapadham, so emperumAn gives him kainkaryam in paramapadham as AzhwAr desired]. This entry was posted in thiruvAimozhi, thiruvAimozhi 4th centum on April 20, 2017 by Sarathy Thothathri. 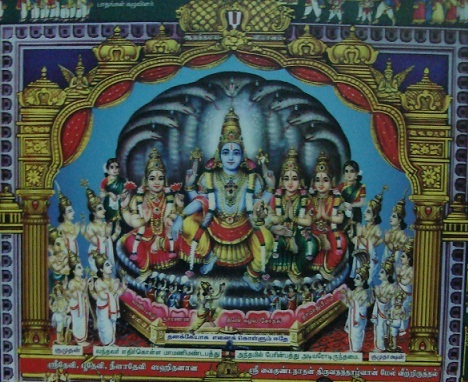 In ninth pAsuram, emperumAn mercifully manifests his divine presence in thirunAdu (paramapadham) to AzhwAr to eliminate all of AzhwAr’s grief; AzhwAr, having seen it and having mercifully given up his attachment for all other matters says “you have presented your divine feet which are difficult to attain; I have enjoyed that” and feels satisfied. aNaiyAy – Oh one who is having as bed! adhu – your nature of being easy to be attained and difficult to be attained with respect to devotees and others respectively. You please accept me at your perfectly enjoyable divine feet. If one tried to see, by one’s own effort, you make sure that even dhEvas do not see and enjoy you and agitate them; oh one who is having thiruvananthAzhwAn as bed! I too who am a servitor, know your nature of being easy to be attained and difficult to be attained with respect to devotees and others respectively. Eliminating my affection in worldly matters with all traces, you made me, who have great desire towards you and cannot live without you, hold your perfectly enjoyable divine feet on my head and follow you as said in “yEna yEna dhAthA gachchathi” and accepted me at the divine feet which are difficult to reach; I certainly saw (it in front of me) and enjoyed this. kUttudhi nin kurai kazhalgaL – Even if unqualified, you accept those who are dear to you, at your divine feet. kurai – greatness or the sound of the ornament. imaiyOr … – Even brahmA et al, if you don’t consider them to be acceptable, you will agitate them so that they don’t reach you. aravaNaiyAy – This is an example for “kUttudhi” [those who are with him irrespective of their knowledge – since AdhiSEsha is in a reptile form, he is considered as less intelligent in layman terms]. adiyEnum adhu aRivan – I know your nature which is well revealed in scriptures of this world (ithihAsams and purANams). How did you know [Did you know through SAsthram]? vEtkai ellAm viduththu – Before, whatever that was not related to you, did I not desire for all of them? Is there anything that I have not desired in your [material] world? Did you not remove my attachments as said in thiruviruththam 95 “yAdhAnum paRRi nIngum viradhaththai nalvIdu seydhu” (my attitude of leaving you citing any reason, was reformed by you)? un thiruvadiyE sumandhu uzhala – To have all the attachments I had in worldly matters (before), at you (now), holding on to your divine feet only and having that only as my routine. kUttariya … – You accepted me at your divine feet which are difficult to attain by self-effort of even great personalities. I am not saying these based on hearsay, but based on personal experience [nAn kaNdEn]. This entry was posted in thiruvAimozhi, thiruvAimozhi 4th centum on April 19, 2017 by Sarathy Thothathri. In eigth pAsuram, emperumAn says “Alright. I will fulfil your desire” and AzhwAr asks “When?”. Subsequently, AzhwAr says “When will you, who are the antharyAmi of the entire world, eliminate my presence inside this material world and accept me at your divine feet?”. Eighth pAsuram. emperumAn says “I was ready to take you to paramapadham, but as you said ‘no’, I stopped short of doing it; do you have to beg me to get this done?”; AzhwAr asks “if you are ready to do it, when will you do it”. [Did AzhwAr refuse to go to paramapadham?] AzhwAr said in thiruvAimozhi 2.9.1 “emmA vIttuth thiRamum seppam” (won’t ask the great benefit of paramapadham). kUttudhi – will you unite me? 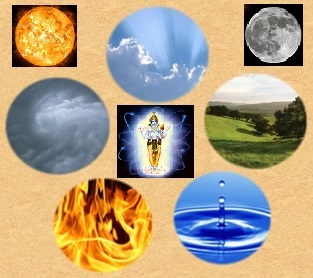 You who are the unconditional cause, revealed (in previous creation) concealment as said in “thama: EkIbhavathi” and creation as spitting out what was consumed before, without any change as said in “yathApUrvamakalpayath“, collecting the five great elements starting with pruthvi (earth) and placing them in outside (as layers) and inside as abodes for those who don’t blink their eyes such as brahmA et al – this unparalelled oval-shaped world which is an unbreakable fort is created in this manner; when will you free me from this world and unite me who am desirous to attain your divine feet (which is difficult to attain) in the greatly radiant, most supreme distinguished/special abode, paramapadham, as said in “viSvatha:prushtEshu sarvatha: prushtEshu” ? 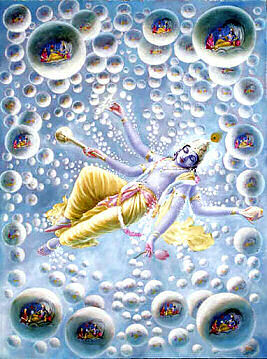 kAtti – Like a magician; emperumAn manifested how he previously consumed everything as part of deluge and made them to be identical with him and made the jagath (material world) exist [as a lump] and how he subsequently created them as said in thaiththirIya upanishath nArAyaNavalli “dhAthA yathApUrvamakalpayath” ([bhagavAn through] brahmA created like it was present in previous times (before praLayam)). nI karandhu umizhum – You who are the creator, yourself protected everyone by placing them inside you during deluge, and once the deluge was over, you let them out. Alternative explanation – you will manifest the concealing and you will manifest the spitting out. Through the five great elements which are consumed and spat out. Itti – collecting them. Here thrivruth karaNam (process of creating, using the three great elements – earth, water and fire) is explained [Highlighting thrivruth karaNam is a sample for explaining panchI karaNam (process of creating using the five great elements)]. As said in SrIvishNu purANam 1.2.54 “samEdhyAnyOnya samyOgam paraspara samASrayA:” (the five elements starting with earth are mixed with each other and are present in every object), these five elements cannot create any object on their own; even when together in equal measures, they will not lead to any visible object; like a potter will mix dust, mud and water in different proportion to create pots etc [emperumAn creates these objects by mixing the elements in different proportions]; if the mutual causes remain in a singular form, the effect will also remain singular [indistinguishable from each other]; these five elements remain the primary raw materials and secondary raw material to create different forms such as dhEva (celestial), manushya (human), sthAvara (plant) and jangama (animals). In this manner, emperumAn collects them and creates, using them. nI vaiththu amaiththa – You created and placed. imaiyOr … – To let me leave from this fort which is the unparalleled world where brahmA et al engage in mischievous acts. A fort is where one cannot enter from outside (easily) and one cannot exit from inside (easily) – it would be like a maze where the entry and exit points are difficult to ascertain. emperumAn himself said in SrI bhagavath gIthA 7.14 “dhurathyayA” (difficult to cross over). ennai – Me who am caught in this fort and who do not know the way to escape. Me who am surrendered to you as you instructed in SrI bhagavath gIthA 7.14 “mAmEvayE prapadhyanthE mAyAm EthAm tharanthi thE” (Only those who are surrendered to me, can cross over). un kozhum sOdhi uyaraththu – To the infinitely radiant paramapadham which is untouched by material aspects and which is in the mode of pure tranquility. 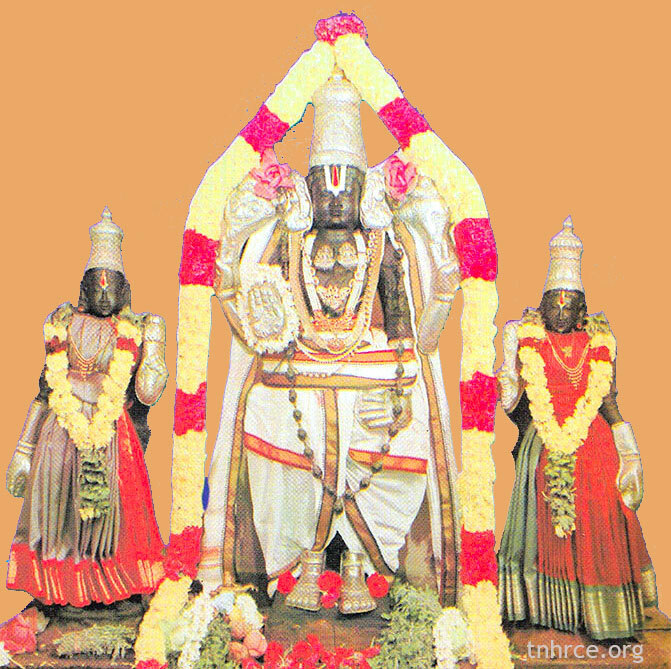 kUttariya thiruvadikkaL – The divine feet which are unreachable based on one’s own self-effort. engyAnRu – At least if you said as in SrI bhagavath gIthA 18.66 “mAsucha:” (do not worry), I can be content as said in SrI bhagavath gIthA 18.73 “sthithOsmi” (I am well situated); so, you should just mercifully say “I will accept you at my divine feet”. You should mercifully say that you will come in 14 years to make bharatha happy as said in SrI rAmAyaNam ayOdhyA kANdam 112.25 “ArurOha ratham hrushta:” (bharatha climbed the chariot happily along with Sathrugna). You should place me who want to be freed from here, in the abode where you place those who are dear to you – when will you, who are omnipotent, do it? You who created this fort, yourself should free me from it. One should surrender to emperumAn only to have the hurdles removed and to attain him also, he should be attained through him only; SrI bhagavath gIthA 7.14 “mAmEvayE prapadhyanthE” (surrender unto me only) and SrI bhagavath gIthA 18.62 “thamEva SaraNam gachcha” (surrender unto him only). piLLai thirunaraiyUr araiyar explains “No one can dismantle a nest created by a sparrow; how can the weakest samsAri break the nest/web created by sarvaSakthi (bhagavAn who is omnipotent) based on the karma of each individual, without surrendering unto him?”. This entry was posted in thiruvAimozhi, thiruvAimozhi 4th centum on April 18, 2017 by Sarathy Thothathri. 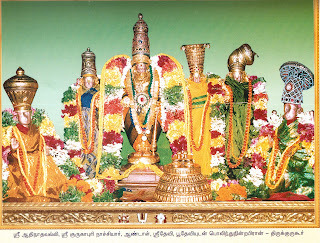 In seventh pAsuram, as AzhwAr‘s desire was not fulfilled immediately, he thought emperumAn remains silent thinking “you yourself try and reach me” and says to emperumAn “as the identity, existence etc of all entities are fully under your disposal, instead of showing this samsAram which is turning away from you, mercifully see that I reach your divine feet”. Subsequently, AzhwAr says “You who are the antharyAmi of everyone should accept me so that I don’t see this cruel sorrow-filled world”. As you exist yourself [i.e., the in-dwelling super soul] as the movable and immovable entities without any other entity in this world, mercifully call and accept me who am a servitor (of you) to eliminate these disease, old-age, birth, death, pain (also poverty) which are cause for sorrow; hide the cruel world from me. ivvulagaththu niRpanavum thiriuvanavum nIyE – AyE – You are the prakAri (substratum) and all the movable and immovable entities of this world are the prakAram (attribute) and thus they all are indicated as “you”. maRRoru poruLum inRi – Explaining that there is no entity which is not pervaded by brahmam (bhagavAn) and existing independently as said in katavalli upanishath 2.4.11 “nEhanAnAsthi kinchana” (There is no plurality of entities) and in bruhadhAraNyaka upanishath 6.5 “AthmaivAbhUth thathkEnakampaSyEth” (once one realises that the world is the body of paramAthmA, he can independently see that one paramAthmA). nI ninRamaiyAl – after you exist in such manner. nOy … – An AthmA (soul) will feel joyful or sorrowful for the occurrences on its dhEham (body); since you are having such relationship with me, you [should] eliminate these anguishes which are caused by birth. nOy and piNi are synonyms – here they are used to identify mental and physical diseases. kUyE koL – You should mercifully call for and accept me instead of thinking “let him come on his own”. kodu ulagam – This world which is engaged in worldly pleasures based on sound, touch etc, leaving you aside. kAttElE – Like dhrushti visham (the poison which kills on seeing it), if AzhwAr sees this world, he will die. Since AzhwAr is requesting emperumAn to hide this world from his vision, it is to be understood that he is not seeing it. But when emperumAn shows the world to him just as he mercifully bestowed faultless knowledge and devotion to AzhwAr, AzhwAr will see it. But how does it match with AzhwAr saying “ivai enna ulagiyaRkai” (How sad are these worldly situations!) – due to “parahitham” (well-wishing for others), AzhwAr meditated upon that before; here, AzhwAr is saying “You should make sure that such worldly situations do not touch me”. This entry was posted in thiruvAimozhi, thiruvAimozhi 4th centum on April 17, 2017 by Sarathy Thothathri. In sixth pAsuram, AzhwAr meditates upon the faults of the samsAris (worldly people) such as not being interested towards bhagavAn etc and avoids being upset with emperumAn [for not helping them], prays to emperumAn “please accept me at your divine feet to be relieved from my association with them”. aRap poruLai aRindhOrAr ivai enna ulagiyaRkai? ivai enna ulagiyaRkai – How sad are these worldly situations? 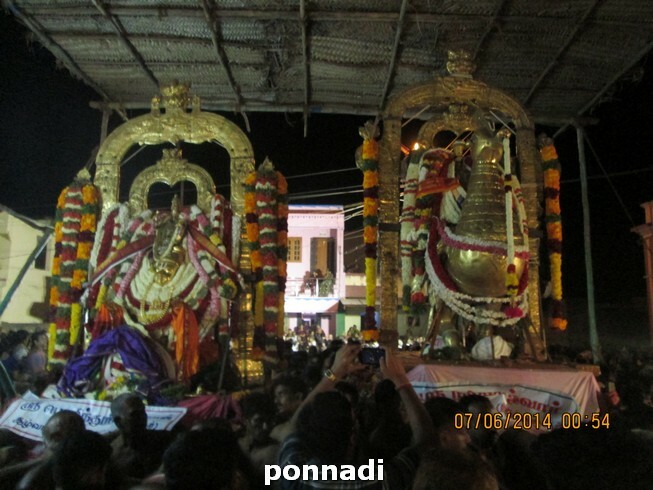 mudiyAnE – oh one who is wearing divine crown! adimai koNdAy – Oh one who enslaved me! amudhE – Oh divine nectar! kUyaruLAy – mercifully invite me and accept me. How sad are these worldly situations where those who don’t know and determine that dharma is the first goal, will make one to be afraid, captivate him in the net of fear, catch him and kill him so that there is no trace of any such incident, and live their life [in this manner]! 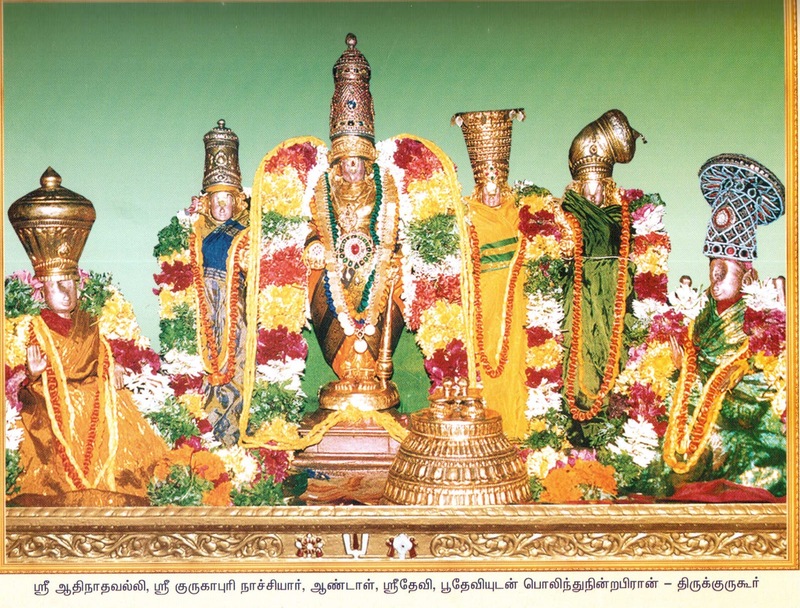 Oh one who is wearing divine crown which is having very fragrant thiruththuzhAy (thulasi)! Oh one who enslaved me, an embodiment of sins, to exist exclusively for you! Oh perfect and most enjoyable divine nectar for me! mercifully invite me and accept me at your divine abode. aRap poruLai aRindhOrAr also means those who know wealth only and do not care for anything else. maRukki … – This is how village heads make their earnings; an individual will appear [to the village head] like a “sAdhu” (kind hearted, good person) and will think “if we live in a town, we should have some trustworthy support” and will go to the village head; the village head, realizing the innocent nature of the individual, will tell him “many are speaking about you in different ways”; hearing that, the individual will become fearful and believe “only the village head can protect me” and ask the village head himself what needs to be done to protect himself; the village head will then say “you place your wealth in my house and give ownership of your properties to me, so that if something happens to you, I will protect you”; bewildering one’s mind in this manner. val valaip paduththi – making the individual fully depend on him [the village head], so that the individual can never escape. kumaiththittu – he [the village head] will then write off all wealth for his own expenses but will actually give it out for high interest [to earn wealth]. konRu – he [the village head] will then think “if he continues to live, some day he may take shelter of some one else and come at me” and will kill him. uNbar – this is how he [the village head] makes his living. aRap poruLai aRindhu – Knowing the truth about dharma as “there is an AthmA (soul) which is different from the dhEham (body); our current actions are contrary to the nature of the soul”. OrAr – Not determining this [principle of dharma] to start with. Alternative explanation – Not giving up harming others. orudhal – oruvudhal – leaving; i.e., not leaving the act of harming others. Another explanation – such people would only know the goal of artha (wealth), being greatly interested in that, they will not see what is good or bad [and just act as they please]. Oh lord! What kind of worldly activities are these? veRi .. – Oh lord with divine crown having fragrant thiruththuzhAy! you manifested your enjoyable nature and enslaved me who am in the midst of these samsAris. 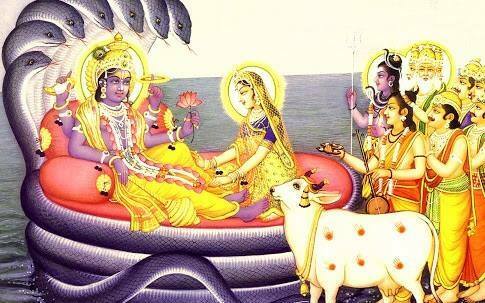 vinaiyEnai – Me who am having sins to be born amidst these persons who are attracted to worldly pleasures. You accepted my service at your divine feet out of your causeless mercy, even though I am not qualified for such service. ini – after having enslaved me. en AramudhE – Oh one who is perfectly enjoyable for me! you should accept me so that I reach your divine feet after giving up the existence in the midst of these samsAris. ini en – As they have not interest in the adhrushtam (the unseen – paramapadham), what is the use of my worrying for their disaster? Can I not give it up? First, mercifully accept me at your divine abode, paramapadham. This entry was posted in thiruvAimozhi, thiruvAimozhi 4th centum on April 16, 2017 by Sarathy Thothathri.